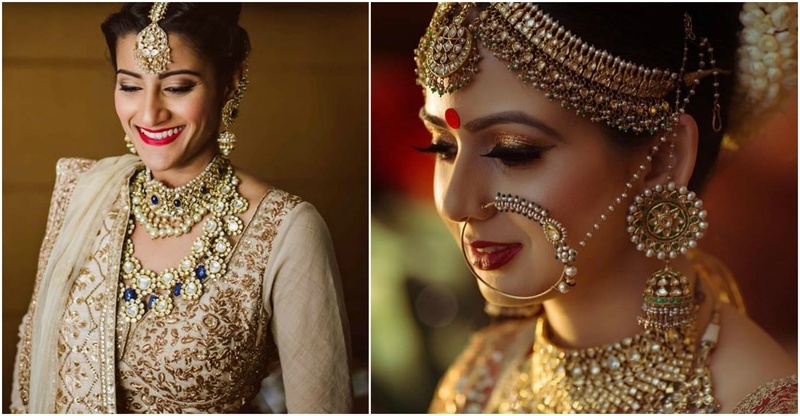 Kundan or polki, what to opt for your wedding jewellery - right from the experts! If you’ve always wanted your jewellery to give you an elite, regal and traditional look, then you should definitely go for kundan or polki jewellery. A lot of us get confused when questioned about what goes with what and why. Although kundan and polki jewellry look quite similar, they are very different from each other! How did the two originate? The process of making Kundan and Polki jewellery is extremely intricate and time-consuming and requires great skill and craftsmanship. Both of them are thousands of years old art. While Kundan jewellery dates back to the grandeur of the Mughal era, Polki is a famous Rajasthani jewellery style! Both of these are very popular amongst the millennial brides who aspire to look traditional and regal on their D-day! Polki is made of uncut diamonds, while Kundan is made of glass stones. Hence, polki shines brighter and is more expensive. How is Polki Jewellery made? Polki is uncut diamonds in their raw, pure form. It is is made by placing uncut diamonds in gold jewellery using gold foils and lac. Polki does not undergo chemical treatments, unlike other diamonds. It doesn't have a very clear colour giving it a very rustic look. Although, the diamonds placed on a foil of pure gold lends it a brilliant shine when they reflect light. They are then fused with the gold jewellery and further adorned with pearls and other precious stones like rubies and tourmalines to enhance its beauty. Since it's the purest form of diamonds available, it's extremely expensive. There are a lot of families that have passed on polki as heirlooms. The process of Polki is the same as Kundan. With Polki, Kundan can also be used, making it even more expensive. How is kundan jewellery made? Gold is beaten up into strips and shaped into the desired form to form the base. The glass stones - emeralds, rubies, sapphires, etc. are carefully set into the base to make what is called Kundan. It doesn't have a very high content of Gold it can even be a faux metal base, as it is mostly about the stones. The elaborate process begins with the skeletal framework called Ghaat. Finally, the gems are polished using the Chilai process. This type of art is native to only India which makes it extremely sought after. Does Kundan / Polki jewellery look good with gemstones? Totally! While Kundan and Polki both have elaborate meenakari and enamel work on them in varying colours, either of them also looks great with uncut rubies, sapphires and even emeralds. What jewellery pieces look great with Kundan/Polki? For all you brides-to-be looking to opt for either of them, you can opt for a heavy choker or an elaborate neck piece. If you don’t want something very traditional and heavy, you can go for large chandelier shaped Kundan earrings or a beautiful dainty maang-tika or even a gorgeous stand alone statement piece like a bracelet. Chandbalis in Kundan/Polki is the most trending jewellery trend of 2017-18!